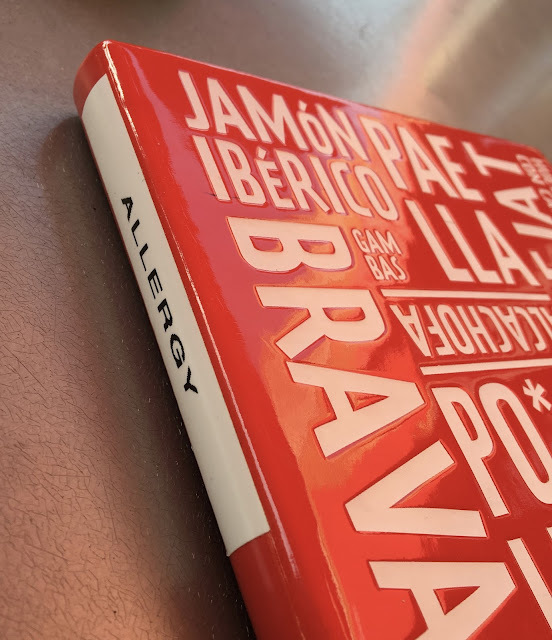 In my last post- I shared the allergen menu from Jaleo, a Jose Andres restaurant with locations in and around Washington D.C. Now, here is my full recap of dinner at this upscale restaurant that takes Spanish tapas to the next level. Arriving to Bethesda around late afternoon, I dropped my bags at my hotel and ventured right back out a couple blocks to Bethesda Row, a shopping center with a pretty impressive line up of retail and restaurant options. Arriving earlier than my reservation time, I was seated immediately and settled in for a truly indulgent foodie affair. I rarely get to enjoy restaurants of this caliber- especially outside of Baltimore, so this definitely was a true treat. 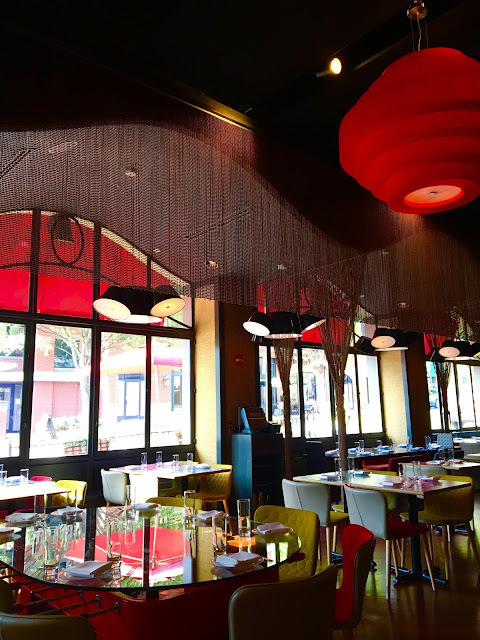 I was inside only for a few moments, but was enchanted by the eclectic decor, which was eye-catching and definitely set the tone for the whimsical menu that strives for playful takes on Spanish classics. I opted for an outdoor seat, both the take in the beautiful day and the prime people watching as people hustled and bustled around on a Saturday evening. 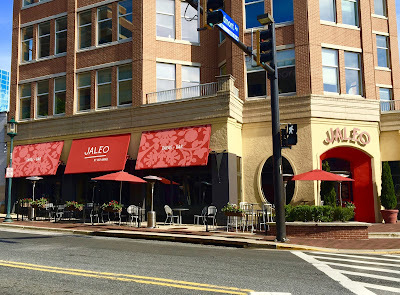 Like other Andres restaurants (I have reviewed Oyamel and Beefsteak), Jaleo is really allergen-conscious, having an entire allergen-labeled menu (see it in full here) on hand that covers gluten, dairy, soy, and other common allergens in all of their menu items. With so many small plate options, I had a hard time choose what to order. My waitress, knowing that I was limited by gluten and dairy actually suggested the special of the day, an heirloom tomato salad. Normally it would have come with cheese- but it was easy enough to leave out, and I went with the recommendation happily. The tomatoes were unbelievably fresh and flavorful- as summer tomatoes should be. They were joined by lettuce, onion, and olives. Enough dressing was drizzled to add flavor, but not enough to drown the salad. 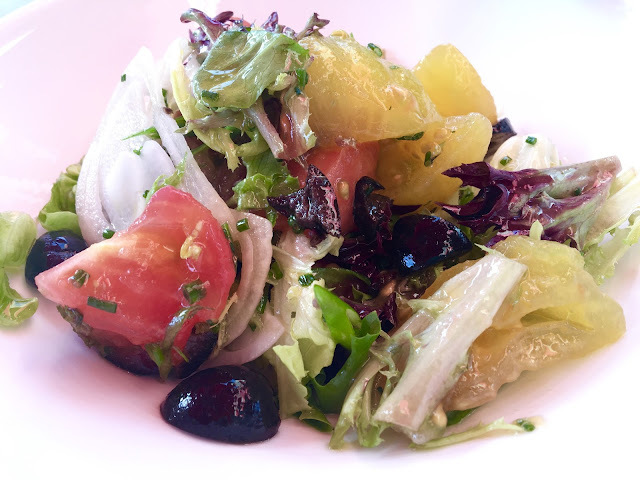 I loved the simplicity of the dish, and that it was a perfect choice to celebrate the flavors of summer. As my main tapas, I ordered the vieiras con guisantes, or sea scallops with green peas and mint. Though the dish be small, it was mighty in form and flavor, almost too beautiful to eat- but eat it I did. The scallops were wonderfully tender, seared and seasoned minimally to let the scallopy goodness shine through. 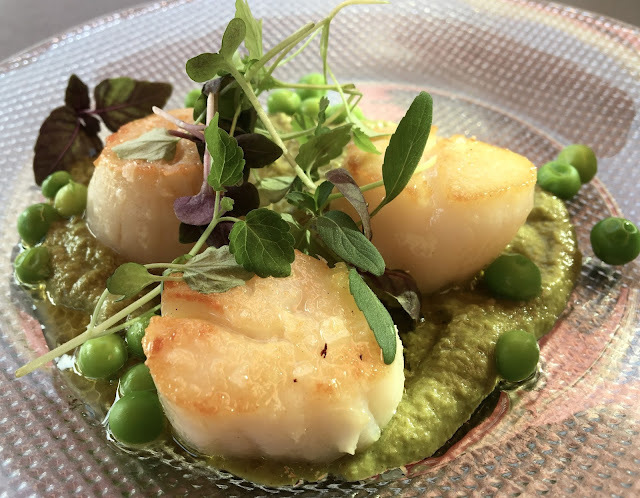 They sat atop a bed of minty pureed peas, which added a nice infusion of flavor that only enhanced my relishing of every bite. The dish was practically perfect in every way, and I can attest that it is the best preparation of scallops I have ever had in a restaurant. 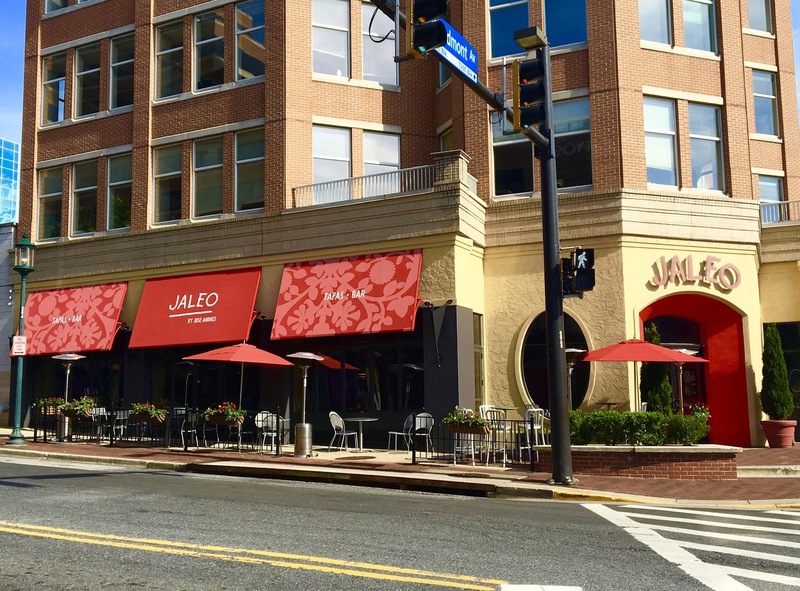 Jaleo definitely impressed me with the dishes I sampled. My one caveat is that Jaleo is pretty pricy. I will definitely not be a regular here, but will definitely come back for special occasions- especially with a group because I want to sample the gluten-free paellas which serve 6 people. However, the prices do correspond with quality, as my meal clearly shows. I loved how the staff were allergen friendly, noting my needs from my Open Table reservation- a rarity that has only occurred a couple times before (one such occasion being at another Andres restaurant (Oyamel). I left definitely impressed, and love the peace of mind that comes with dining out knowing you are in good, allergen-aware hands.